A constant breeze, broad, flat waters and great access, it all comes together to create an ideal spot for a sailing regatta. With the International A-Class Catamaran North American Championship coming to the Outer Banks this week, the open waters of the sounds have taken their place in international competition. 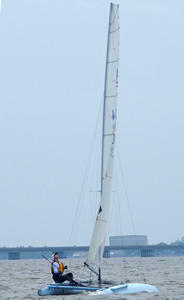 The A-Class Catamarans are 18′ double-hulled sailboats with a single mast. Lightweight and maneuverable, in the 12-15mph winds of the past few days, they are almost skimming the water. There’s about 50 boats competing with competitors from all over the eastern seaboard and Canada. The put in site is at the Old Swimming Hole between the Dare County Airport and the Aquarium on Roanoke Island with the race course between the old Manns Harbor Bridge and the newer Virginia Dare Bridge. The winds were a little bit shifty yesterday and they only got in two of the three heats organizers were hoping for. Wind conditions dictate the race course and if the winds shift to dramatically mid race, the course has to be reset and the race called off. Nonetheless, competitors and organizers were singing the praises of the Outer Banks as a race site, pointing to facilities, and the course itself.